My Food Allergies is a wonderfully illustrated, interactive children's book that tells the story of a small boy and his family as they learn he has serious food allergies. 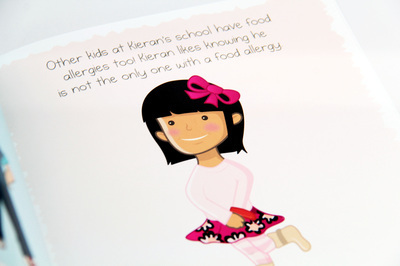 A book to help children and their families with food allergies. Addresses the unique practical aspects of being a kid with food allergies. Beautifully illustrated with vivid colors. 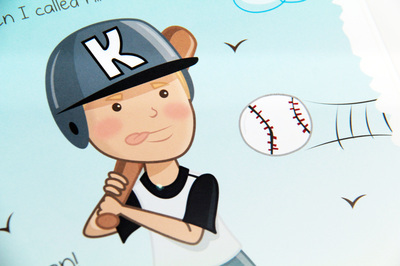 Printed on high-quality gloss paper. 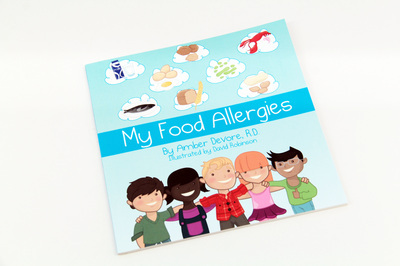 My Food Allergies is a children's book that helps children and their parents understand the unique practical and social implications of being a child with food allergies. This book is great for children with any of the top eight food allergies (milk, eggs, fish, shellfish, peanuts, tree nuts, wheat, ans soy), as well as less common food allergies, and multiple food allergies. Also available as an e-book on Kindle! Click Here! "The best part of this book? Well, there are two best parts. The first are the illustrations, which are quite attractive and cheerful. I enjoyed the artwork. The second and maybe even better part is the guided discussion, where you can read the book with your child, include them in the story and then involve them in making themselves safe from food allergens." A food allergy occurs when the body’s immune system sees a certain food as harmful and reacts by causing symptoms. This is an allergic reaction. Did you know that food allergies now affect 15 million people in the United States, including 1 out of every 13 children? And many of those children have food allergies with anaphylaxis, a life threatening condition. While some allergies will subside as the child grows, many food allergies are lifelong. Researchers are working hard to identify the cause for the increase in food allergies and searching for a cure. In the meantime parents, caregivers, and friends can access great resources from organizations such as Food Allergy Research and Education and Kids With Food Allergies.